TCS has built an in-house 10 kW-thermal hot air system to test waste heat recovery systems. 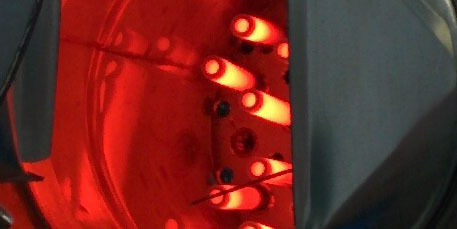 The heat flux can be adjusted by phase control and various measurements are logged automatically. This system represents an ideal opportunity to test the complete waste heat recovery systems that we are developing. It is useful to investigate thermal mismatch, varying heat flux, the effect of cooling temperature and flow rate, the performance of our maximum power point tracking algorithms and power converters, over-temperature protection mechanisms and thermal cycling.